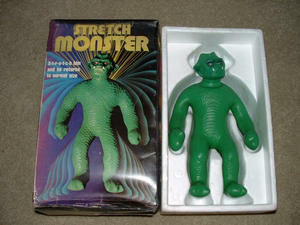 The Stretch Monster released from Italy definitely one of my favorites,especially because Im 100% Italian Heritage.But Im sure nobody could give a shipping can get a little pricey on these when sent from Italy,But who cares as long as you get it!Try to buy one directly from Italy or from me if I ever sell one because I got my 2 Mostros from Italy a few years ago.These Monsters are awsome! 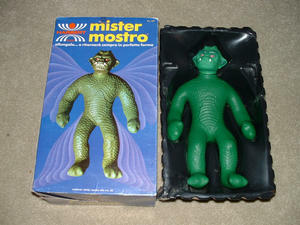 with the nicest most supple skin out of all the stretches.The Mostro has seemed to vanish as quickly as it appeared . Last Mostro sold was almost one year ago.This stretch comes in a black plastic coffin and a small top matching piece that fits over the chest area very similiar to the Denys Fisher Stretch Incredible Hulks Coffin..Also comes with instruction booklet. Value is for a c 10 box, Instructions, plastic coffin and top piece. You have to have one of these for sure.Value $1,200 to $1,800 depending on its condition. The Super Stretch Mask! This is a full size stretch figure.This is one rare figure.Only 7 of these Masks have surfaced in 7 years,And I happen to have 5 of the currently 7 known examples.Thats because there is said to have been only a total of 10 to 50 ever made and only very limited boxes.I have 3 boxes.This information came straight from the Hasbro Employee who worked on them. 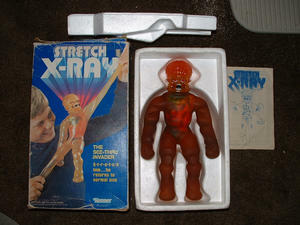 I do know where one more of these Stretch Masks are.There is absolutely no information on these Stretch Masks anywhere on the internet except for a new site called the Unofficial Mask Website. This site is where you will find the most information on these Mask figures.I also contacted Hasbro and Kenner and they have no record of producing these figures even though the box has both Hasbro and Kenner names on it.Whats really amazing about these Masks, is the high value they are already achieving for what is a more recently produced figure of 1995.Wow! This is one obscure stretch.There may be one out there that has the complete paint work but I was told none were completed with the final pocket, however recently A Stretch Mask figure was found at a Flea Market in Florida that has the complete paint work, Shirt, Tie and incredibly the pocket! Making this particular Stretch Mask the most valuable of all to date.l have 3 non painted yellow, the 4th and 5th shown here has the shirt and tie, but is missing the Pocket.These are prototype figures that never went to production. 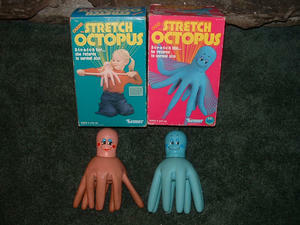 Dont think they would put these out on the store shelves unpainted.They are a very very rare and highly wanted Stretch that is one of the top valued stretches up there with the Serpent. 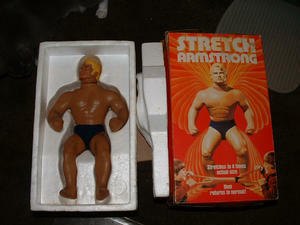 Box and Stretch come with a crudely fasioned cardboard insert. Box is pictured on the Slide Show Page. 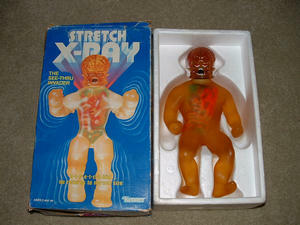 Also see all five of my Super Stretch Mask figures on the Mega 40 page. Gotta luv um! The following values are for Boxed figures only. 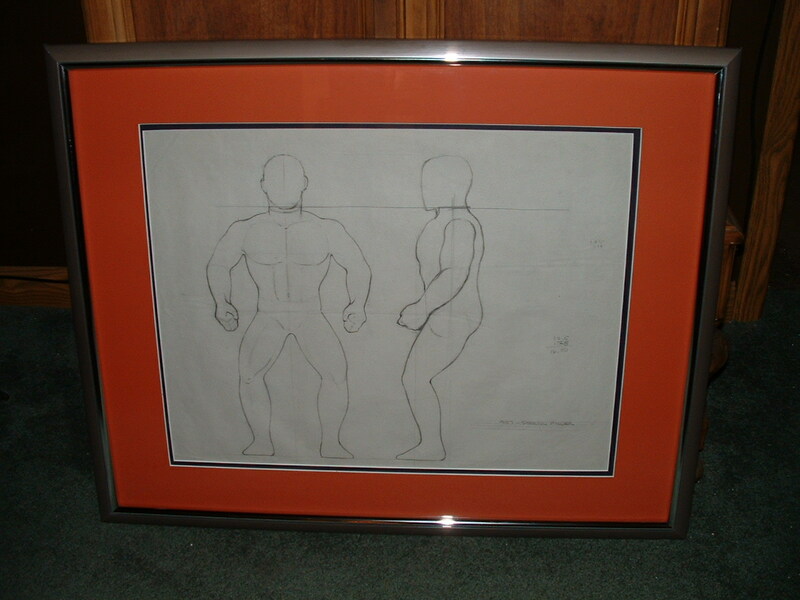 The Boxes are more scarce than the figure making it very crucial to its value. Value Unpainted $1,900 Painted Shirt and Tie $3,200 Complete paintwork $3,700 and increasing by the year. This is one cool stretch, Who Knows, Maybe Jim Carrey has the completed mask? ?